I felt bad for Lewy body dementia this week. On Tuesday, TMZ reported that Robin Williams was “struggling” with the disease, and that it had “triggered” the actor’s suicide in August. If this was the first you’d read or heard about Lewy body, you would probably think: Wow, what a terrible thing. You would not be wrong. My father was diagnosed with Lewy body. As the disease was described to us, it was like Parkinson’s and Alzheimer’s rolled into one because that’s essentially what Lewy body is: Parkinson’s and Alzheimer’s rolled into one. So, no, not a lot of fun. Odder than the bin Laden story was my father’s summer-long search for the baby. You may ask, what baby? I asked myself this, too, as, at the time, my father had four grown children (average age 40.3), no grandchildren and zero acquaintances among the infant and toddler set. But, oh, did that baby worry him. The darned tot was always getting kidnapped or otherwise vanishing. (Somehow, this act of going missing was always the baby’s fault, and not my father’s, even though reasonable people like myself would argue it was his responsibility to keep tabs on the imaginary baby.) In any case, the baby. It troubled him. It troubled him so deeply, apparently, that he never could answer the vital, “What was up with that?” question. My point here is not to sell Lewy body dementia as a good thing, but to remind that like many a bad thing, it may not be as bad as a TMZ headline makes it out to be. The Lewy Body Dementia Association makes a similar point, noting that while an autopsy found Williams’ brain showed signs of the disease, the actor was not necessarily exhibiting dementia before his death. Wonder if TMZ’s meds can be adjusted. For the first leg of my journey, that for the sake of clarity (and SEO purposes) will be plainly called “My Summer of Learning to Play Every Song on the Village People’s Go West Because I Promised My Father (35 Years Ago) I Would,” I learned how to play the first song on the Village People’s Go West. I could say that I didn’t think I could pull off the song lyrically. I could say that my attempt to hide the verses (with their lines about “learn[ing] science and technology”) within a “Beyond the Sea” mashup didn’t work. But what it comes down to is I couldn’t commit to the song as it was meant to be sung: heartily, and with great enthusiasm. 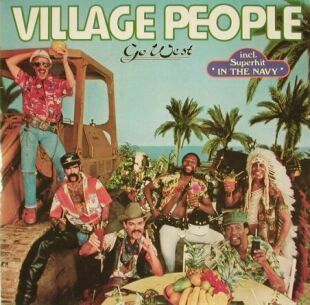 And so the first leg of my journey produced its first lesson: I am not the Village People. Thirty-five years ago this summer, my father bought me the Village People‘s Go West. It was the first album that could be called my album; it was the first album that I wanted to be called my album. I was 11, and I was desperate to start my record collection with this disc. I was so desperate that there, in the aisles of Wherehouse Records in Los Angeles’ Westwood Village, I promised that, in exchange for a copy of Go West, I would learn to play every song on Go West. On the accordion. In any case, a promise is a promise, and 35 years behind schedule or no, I have decided my summer project this summer will be to learn to play every song from Go West. On the accordion. Or sometimes on the ukelele. And while my father never got to hear my non-ironic cover of “Manhattan Woman”—he died 10 years ago from causes unrelated to my unfulfilled Village People promise—you can if you stay tuned here for my occasional updates and videos. One, my father didn’t like to fly, and now he’s in orbit. Four, there is something wrong with me. Seven, in emails, my mother referred to Celestis as “the space people,” á la, “The space people just sent me an email again…,” and I found that phrase, “the space people,” so entertaining that I never bothered with the rest of the emails, plural.